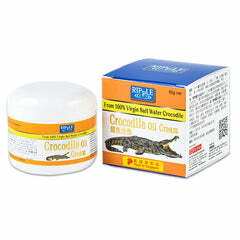 Crocodile Oil is filled with Collagen proteins, amino acids, unsaturated fatty acids and minerals. Our quality product is easily absorbed, protecting and nourishing your skin. 100% refine Saltwater Crocodile Oil (Premium Fragrance). Effective for bleeding cracks from dry skin, knife cuts, frost bite, scalding, insect bites. Nourishes blood and dissipates bruises, reduces scarring. Moisturizes skin and prevents wrinkling, removes freckles, UV protection. Used for flaky and rough skin, prevents smelly feet. Reduces acne growth and repel new acne growth. Effective moisturizer for massage purposes. Shake bottle before use. External use only. Apply 2 to 3 times daily over infected area then gently massage for best effect. Keep sealed in dry cool place. Avoid contact with eyes!